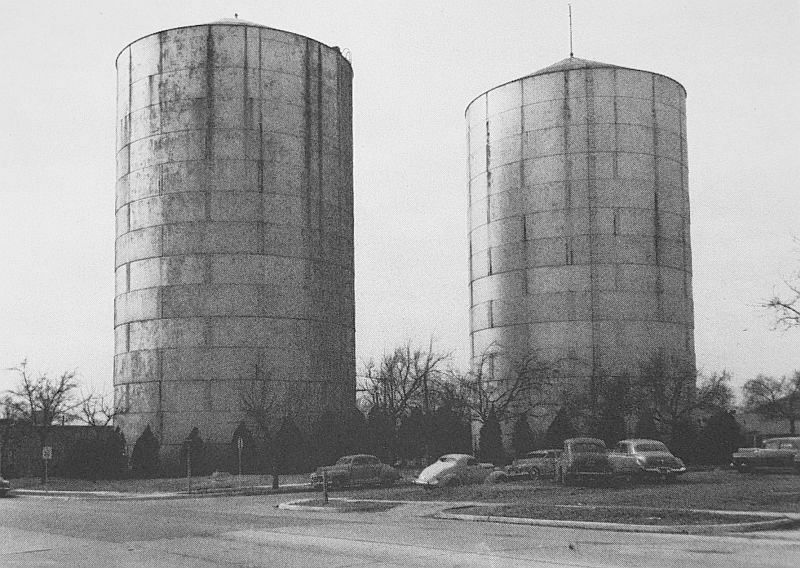 The two large water towers pictured above loomed over the East Dallas neighborhood of Lakewood Heights for over 30 years. 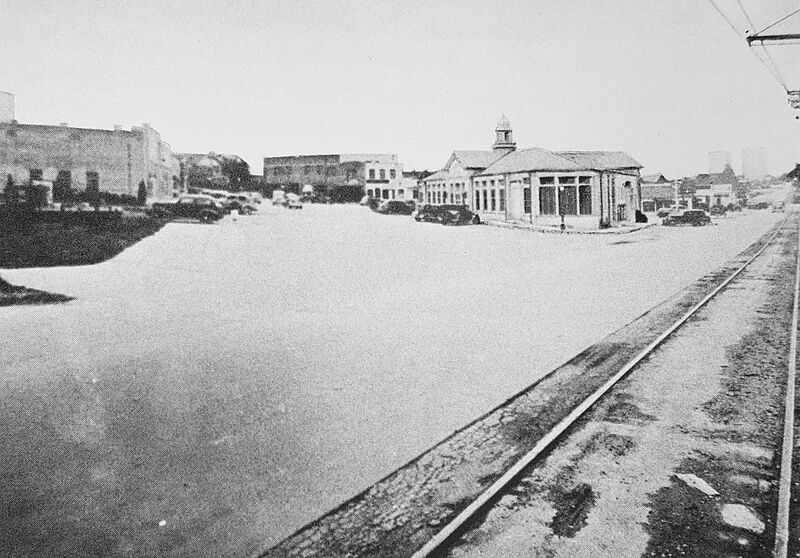 They sat at the southwest corner of what was then known as Greenville Road (not to be confused with Greenville Avenue) and Aqueduct Avenue — the streets are known today as Abrams Road and Goliad Avenue. 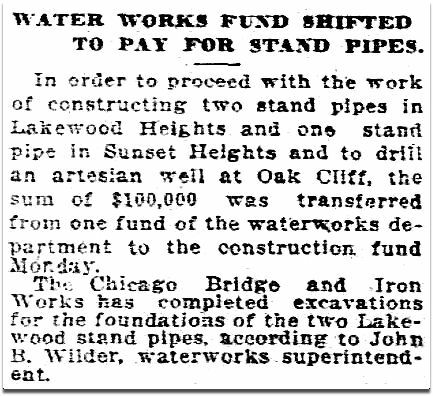 The towers replaced a previous (single) water tank, which, by the early 1920s, was proving inadequate for the needs of an exploding Lakewood area. 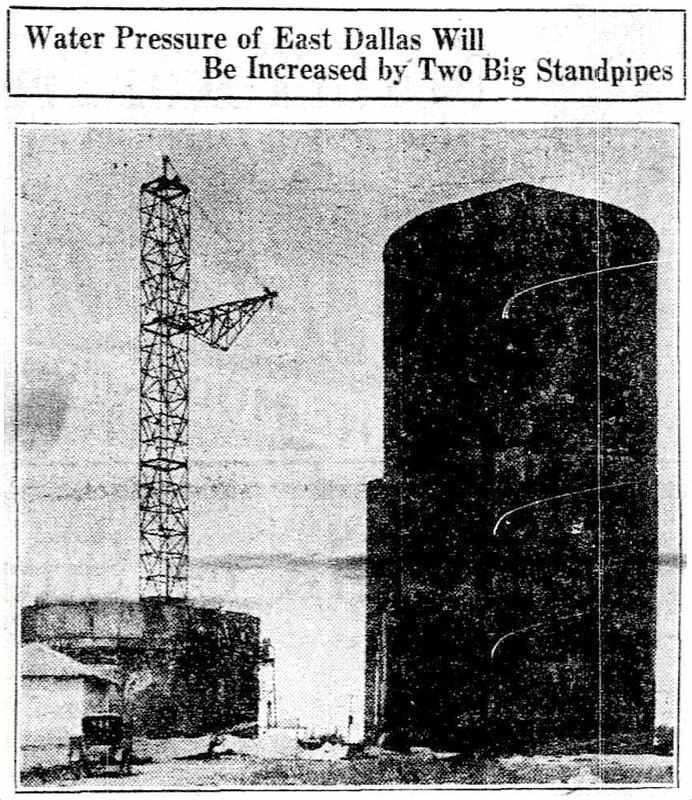 These water tanks — called “standpipes” — were really big: each was 100 feet tall, 60 feet in diameter, and held two million gallons of water. They were erected in October, 1923 and, rather surprisingly, stood until 1955. Even though I grew up in this part of town, I never knew about these tanks until a couple of years ago when I saw a photo in a Dallas history group. It’s hard to believe those industrial behemoths were smack dab in the middle of what is now a jam-packed residential neighborhood. Here are a few photos featuring cameo appearance by the omnipresent tanks. In the first one, from the 1930s, they can be seen at the top right, ghostlike in the distance. 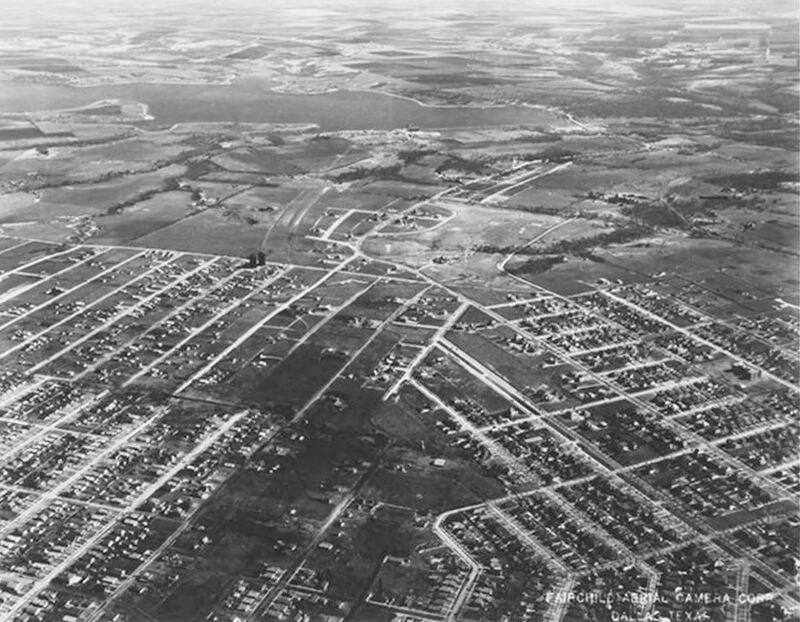 Then there’s this fantastic aerial shot of what would later become the fully developed Lakewood area (and beyond). 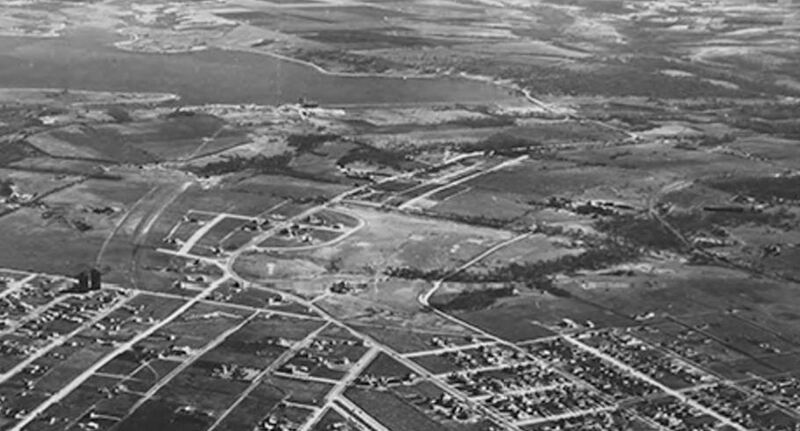 Looking east, White Rock Lake is in the distance, and the two towers — brand new when this photo was taken in 1923, and taller than anything else in the photograph — are at the left. And here is a really wonderful photo which was posted in the Dallas History Facebook group by Mary Doster from the collection of her husband Jim Doster, showing Abrams, looking north, in 1925. 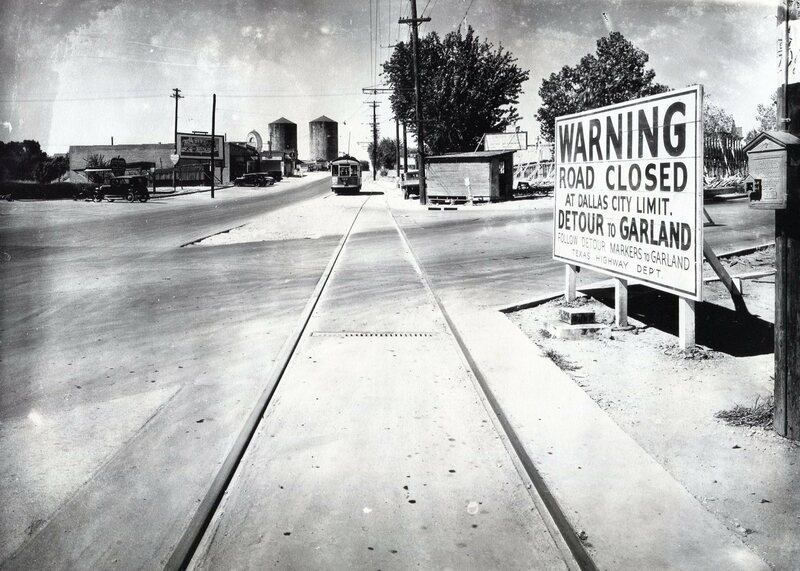 (The location of the twin tanks was actually outside the Dallas city limits in 1919 — see the boundary on a 1919 map here.) I never get tired of seeing streetcars, especially traveling down streets I drive everyday. A few articles about the tanks’ beginning in 1923. The tanks were dismantled in 1955 (pertinent articles are listed below, in the “Notes” section). Their fate, post-dismantling? 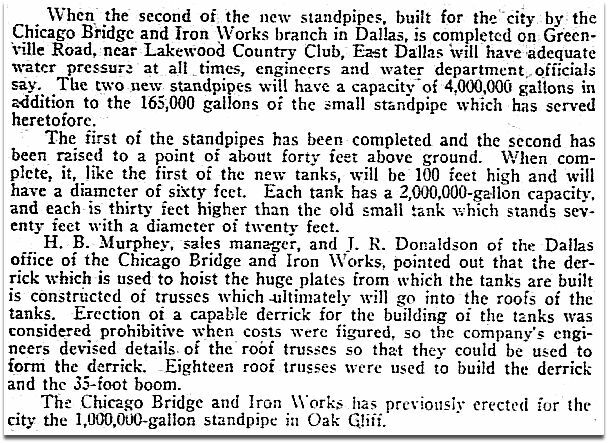 One of them was destined to be reassembled in Tarrant County for the Hurst-Euless-Bedford water system, and the other one was “to be kept as stand-by storage for the city” (DMN, June 7, 1955). First two photos from the book Reminiscences, A Glimpse of Old East Dallas. The present-day view seen in the top photo — looking south on Abrams — can be seen on Google Street View here. 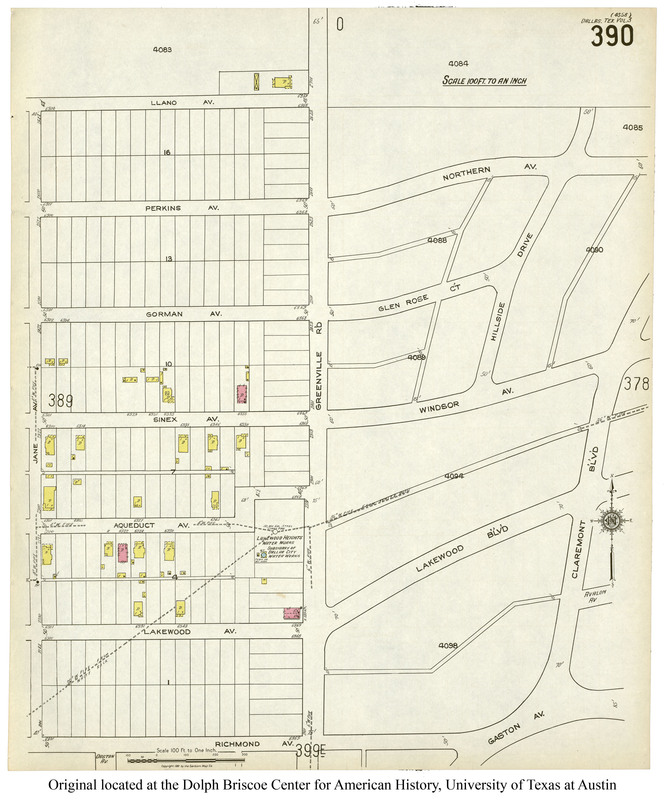 A very interesting Sanborn Map from 1922 — before the twin tanks were built, but still showing the “Lakewood Heights Water Works” — can be found here. There’s, like, nobody living there, man. I’d love to see other photos of these particular “standpipes” — if anyone has any, forward them to me and I’ll include them in this post. Contact info is at the top. As always, images are magically larger when clicked. What an interesting piece of East Dallas history! I have a vague memory of riding past these water towers on my bicycle on my way to White Rock Lake when I was about ten years old. I don’t recall them being removed, but I guess I wasn’t paying much attention back then. I also have a vague memory of a smaller water tower that sat at the high point of Bob O Links Golf Course (near the miniature golf course) just up a bit on Abrams Road. I think that small water tower was privately owned and just for the golf course use, but I don’t know for sure. In any event, thanks Paula for a very interesting article. 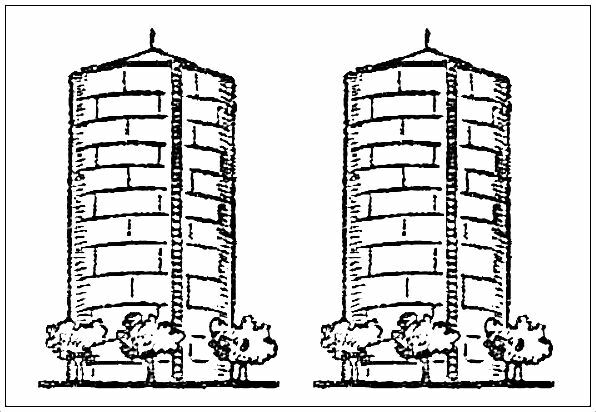 I lived on Palo Pinto st not far from the water towers.. With another boyfriend, we climbed the ladder to the top of the tower. What a great view it was. However we saw a police car many blocks off driving in our direction and climbed down rapidly. Sure enough he pulled up and starting asking about our being up there. Some one had called it in. We pleaded ignorance but the rust on our hands gave us away. He took our names and gave us a stern warning not to do it again. We took his advise.